Are You on the Same Investment Page with Your Clients? 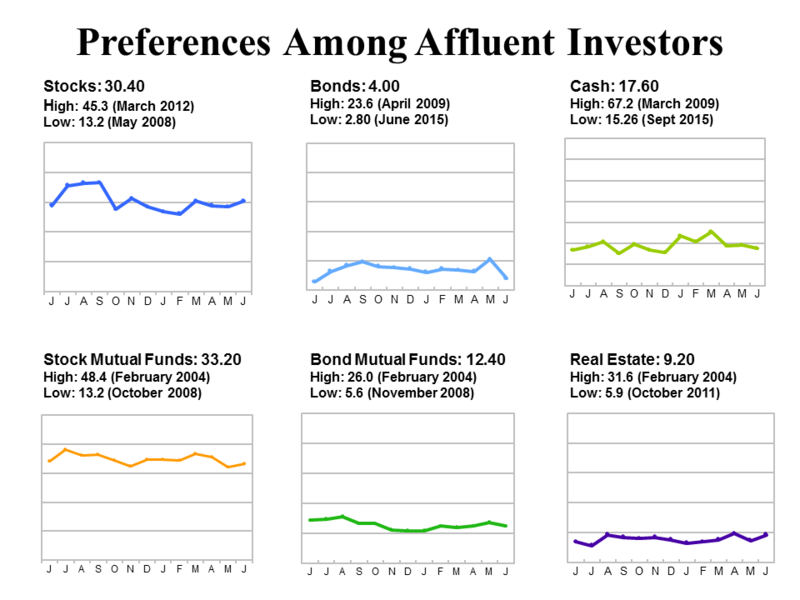 Each month we ask Affluent investors how they intend to invest in the coming months. Will they boost their investment in equities? Opt for more conservative vehicles? Will they hold on the investment sidelines? Their responses are one of the primary drivers of the monthly Spectrem Affluent Investor Confidence Index (SAICI®), and the Spectrem Millionaire Investor Confidence Index (SMICI®). The indices each gained four points in June, an indication that Affluent investors, despite concerns about the economy, plan to be more engaged with the market in the coming month. As in May, the largest percentage (38 percent) of these investors with more than $500,000 of investable assets and those with $1MM or more reported they would primarily hold on the investment sidelines. Tellingly, this is basically unchanged from last month, when 38.80 percent said they would hold on the investment sidelines. Interestingly, there was an uptick in those who would invest in Equities in the coming month. At just over 30 percent, intention to invest in Stocks ticked upward 7 percent from the previous month. At just over 33 percent, intention to invest in Stock Mutual Funds edged upward 4 percent. Intention to invest in Bonds fell to a one-year low. There was also a decrease (8 percent) in those who said they would invest in Cash. We further analyze responses to our monthly investment preferences questions by several investor segments, including wealth level, gender and political affiliation. We find that between non-Millionaires and Millionaires, there is little difference from the previous month in those who indicate they will hold on the investment sidelines. Millionaire intention to invest in Stocks was unchanged from May, but intention to invest in Stock Mutual Funds gained 23 percent. Among non-Millionaires intention to invest in Stocks gained 16 percent, but Stock Mutual Funds declined 19 percent. This was the first time since March 2016 that non-Millionaires expressed a greater intention to invest in Stocks than Stock Mutual Funds. Millionaire intention to invest in Bonds in the coming month dropped 41 percent from May, while non-Millionaire intention to invest in Bonds dropped 78 percent. Between men and women, Affluent women are more likely than men in the coming month to hold on the investment sidelines (40.2 percent vs. 36.4 percent), but this is a narrower margin than in previous months. Affluent men look to be more invested in Stocks (36.4 percent vs. 22.4 percent) and Stock Mutual Funds (35 percent vs. 30.8 percent). Interestingly, there was not a large discrepancy by gender in intention to invest in Bonds (5.6 percent of women vs. 2.8 percent for men) and Cash (15 percent for women vs. 19.6 percent for men). By party affiliation, we find little difference in intention to invest in Stocks and Stock Mutual Funds. Intention to invest in Cash is highest among Republicans (21.1 percent), followed by Independents (18.1 percent) and Democrats (9 percent). Independents indicate the highest likelihood they will hold on the investment sidelines in the coming month (41 percent) in comparison to Republicans (38.9 percent) and Democrats (34.3 percent). Advisors need to understand how their clients are currently feeling about investing in relation to what’s happening in the market and in the media. What are their investment preferences compared to how their portfolio is being managed by the advisor?